It seems that every time I start up my Mac I see an alert about application updates waiting for me. Some of them I don’t want. Is there anything I can do about shutting off these alerts? Yes. 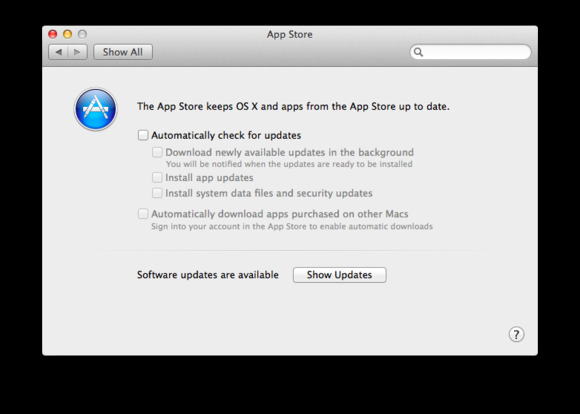 Start by launching System Preferences, selecting App Store, and disabling the Automatically Check For Updates option. Do this and the nudging stops. Of course it also means that you may miss out on some important updates. To help avoid that, you might create a weekly calendar alarm or reminder that reminds you to manually check for updates. You do that by opening that same App Store preference and clicking on the Show Updates button. Regrettably this option isn’t available for all updates. Third-party updates will display no such command and remain in the list. You can hide some updates from the Mac App Store.